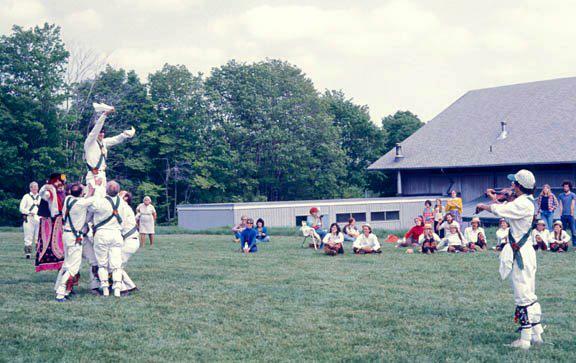 Fifty years ago, when the folk music revival was in full swing and CDSS had only one “S” in its name (Country Dance Society, no “Song”), a varied group of energetic dancers at a CDS Dance Week session at Pinewoods Camp formed the first organized independent morris team in America. This year, the Pinewoods Morris Men celebrate their fiftieth anniversary. Much has changed since those early years, but the team retains its high caliber of dancing, camaraderie and good taste in beer. The Pinewoods Morris Men (PMM) established themselves the summer of 1964 at Pinewoods Camp under the tutelage of Nibs Matthews, then Artistic Director of the English Folk Dance and Song Society. The team toured at camp that same week. An annual fall tour of Harvard Square began in 1966, annual appearances in The Christmas Revels in 1971, and an annual spring tour of Nantucket Island in 1983. In the early years, PMM were simply a loose confederation of any interested men. It was not until 1979 that we joined the ranks of the new local teams all over the United States (many started by former Pinewoods Morris Men) by establishing regular practices in the Boston area. The team has traveled to England three times since its founding: 1984, 1992 and 1998; a Fiftieth Anniversary team will dance in England for a week this summer. And so the team continues, with practices and performances all year long. Some dancers on our current side started their Morris dancing career with us, some learned to dance elsewhere, and some grew up dancing with the team. Martin “Shag” Graetz, founding member and former Squire, continues to dance with us to this day. PMM owe a lot to CDSS, both for its excellent summer programs so closely tied to our origins, and its continued financial and educational support for the Morris dance community. We fund, and CDSS administers, the Karl Rodgers/PMM Scholarship for those who wish to learn Morris dancing at English Week at Pinewoods Camp, in honor of founding member and former Squire Karl Rodgers. If you have ever danced on the Pinewoods Morris Men, we would like to celebrate the team’s Golden Anniversary with you! All current and former dancers are invited to a celebration on September 27, 2014. We would also love to collect any stories or photographs you may have of the team. Please get in touch with our Squire for details, squire@pinewoodsmorris.org. A more complete history, written by Martin “Shag” Graetz, can be found below. As always, if you are interested in dancing with us, contact our Squire, squire@pinewoodsmorris.org. The original article can be found on the CDSS News Archives. Morris dancing was taught almost exclusively in classes offered by the centers and affiliates of the Country Dance Society. When a Morris performance was called for (usually in the context of a CDS-sponsored event, or a local folk festival), a team was put together for the purpose, made up of men (and only men) who attended CDS classes regularly enough to become relatively proficient. Outside the "folk" world, Morris was virtually unknown. In 1963, CDS (Country Dance Society) invited the Artistic Director of the English Folk Dance and Song Society, Nibs Matthews, together with his wife Jean, to be on the staff of the Dance Weeks program at Pinewoods Camp. Nibs had been an active Morris dancer and was a past Squire of the Morris Ring, a loose federation of Morris teams in England. But he had never seen American Morris dancers, and probably did not expect to find any whose style and ability were comparable to those of the English teams. That we could dance at that level must have been completely unexpected. Perhaps what surprised Nibs the most was not that we had individual dancers of high caliber, but that we could assemble something that looked like a team from a diverse pool of dancers who seldom saw each other except at Pinewoods once a year. Even those of us who were lucky enough to live in a city such as Boston or New York, where we could attend regular CDS classes, still had no separate identity as a Morris team. But Nibs recognized that we had the makings a team, so he suggested that we organize one on the English pattern, with a Squire, a Bagman, Bylaws–the whole package. Then he offered the ultimate incentive: once we founded a club, Nibs would sponsor our admission into the Morris Ring–that Inner Sanctum of Morris clubs. It's hard to imagine a more effective boost to the collective ego. Though Nibs and Jean returned to England at the end of their Pinewoods stay, the rest of us climbed all over the idea in the course of the next year. In the meantime, CDS had arranged for Nibs and Jean to come back to the US in 1964 for a full year with CDS, as teachers and what we now call "resource people." At Pinewoods that year, several Morris men who were attending camp met with Nibs to work out the organizational details of what we had already begun to call the Pinewoods Morris Men. With Nibs's help, we drew up some provisional bylaws and elected officers. Our first Squire was Bob Hider, one of the Country Dance Society's finest Morris dancers and teachers. Many, perhaps most, of those present had learned Morris either from him or from dancers he taught. The first Bagman was George Fogg, one of the regular Boston Centre Morris men, who can't possibly have known what he was in for. With the formalities done, we probably then did the most natural thing (especially if we were in C# Minor), which was to move a few yards north to the venue of Arthur Cornelius and reduce his stock of beer. The Pinewoods Morris Men were established. During the next year, Morris activity continued as usual, with ad hoc teams being assembled where- and whenever they were needed. Nibs continued to give advice and assistance, and danced with us whenever possible. A set of permanent Bylaws was hammered out, modeled on those of the Morris Ring rather than of any individual club, because one of our principal functions was to be an umbrella club for all (male) Morris dancers in North America. Peter Fricke designed a PMM kit, consisting of a baldric with red and green sashes, red and green rosettes, and a red escutcheon with a green pine tree. In August, 1965, we celebrated our first anniversary by establishing two traditions. The first was the Annual Ale (which is nothing more than our Annual General Meeting plus generous quantities of ale) at Pinewoods, to conduct business and elect officers. We officially adopted the new Bylaws, accepted Peter Fricke's kit design, re-elected Bob and George, and adjourned to establish the second tradition. This was the Pinewoods Camp Tour. Selected parts of camp were taken to be English villages (many were named for Morris villages anyway), at which we danced for a while and then moved on. In proper English fashion, we started at the home of the local landed gentry, to wit, the summer residence of Mr. and Mrs. Conant, the owners of Pinewoods. From there we processed into the camp proper, stopping at the Square in front of the office; at Field Town, a ring of screened cabins at the top of a small hill) and at Pine Cones, a former summer house on the shore of Round Pond. Having seen us off to a "smashing" start, Nibs returned to England after the end of camp, and in the following year made good his promise; the Pinewoods Morris Men were accepted into the Morris Ring. Our Bylaws limit the Squire to two consecutive one-year terms, so in 1966, we elected Renald Cajolet to succeed Bob Hider as Squire. The quality of Cajy's dancing can be inferred from the answer we used to give whenever anyone asked who the best dancers in Boston were: "There's Arthur and Cajy, and the rest of us." Cajy wanted us to become a team in fact as well as name, and began promoting the idea of a Morris tour to which all PMM members would be invited. That same year, a young Harvard student named Tom Kruskal, returning from a summer in England, joined PMM at Pinewoods. Tom convinced us that Harvard would be an ideal site. Since he also agreed to do the organizing and take care of the necessary formalities at the University, we all agreed that this was a terrific idea. 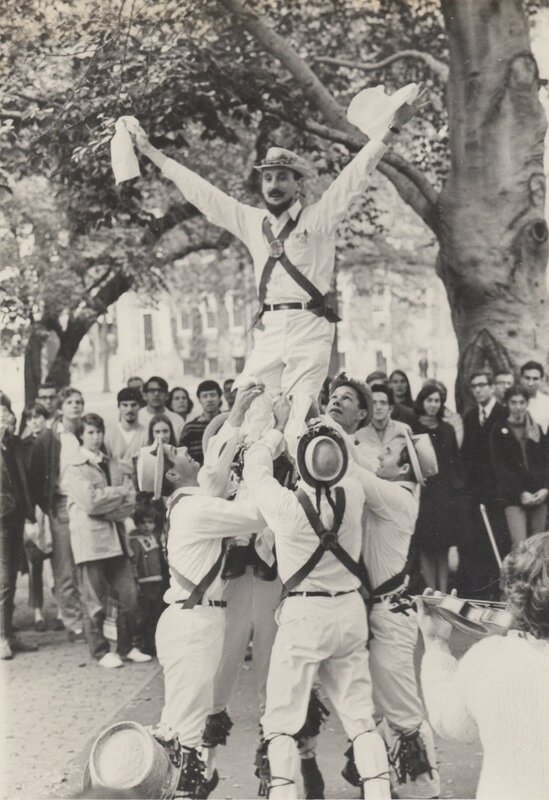 In order to dance on Harvard property, PMM had to be sponsored by an authorized Harvard organization, so Tom invented, and persuaded the College authorities to accept, the Dudley House Morris Club. The Tour took place on Saturday, October 8,1966. Fifteen dancers, mostly from New York City and Boston, gathered at the Radcliffe Quadrangle at 2:30 PM. We did not yet have a regular kit; we wore a mix of New York and Boston Centre demonstration gear. The tour lasted two hours; afterwards, we celebrated in authentic fashion at Tom's apartment, with beer. It was, we all agreed, a satisfying inaugural. Bob Guillard, a long-time Boston-area dancer and teacher, was elected Squire in 1970. One of his first official acts was to ask Mike Stimson of New York to be the Team Historian (we had eight entire years of history at that point). The new baldric was first worn in public by Shag Graetz, at the Westminster Morris Men's Day of Dance in London, England, on May 8, 1971. By August, we were able to present a full side in the new kit at the Pinewoods Tour. In December, 1971, the Pinewoods Morris Men were a featured attraction at the first Christmas Revels at Sanders Theatre in Cambridge. The performance included a stick dance (Balance the Straw? ), the Abbots Bromley horn dance, and a longsword dance in John Langstaff's version of the "St. George" play. Since then, PMM's association with the Revels has continued almost without a break. Karl Rogers was elected Squire at the 1972 Ale. Karl had many talents: racer, musician, singer, teacher, and he was among the best at all of these. In his year as Squire, he founded the PMM Newsletter, and pushed hard for the establishment of a PMM-funded scholarship to Pinewoods Camp for prospective Morris dancers. The first issue of the Newsletter appeared in December, 1972. Rumblings of the Morris Explosion were being heard; though the Village Morris Men had come and gone, their members were not sitting around. Roger Cartwright was in Boston making noises about a new team and John Dexter was already at work in Binghamton, NY. From the first, then, the Newsletter was intended not only to report PMM activities, but also to exchange views and ideas among all Morris dancers. Karl's success in establishing the format led directly to the creation of the American Morris Newsletter less than five years later. By 1973, the symptoms of Let's-go-to-England syndrome, which eventually afflicts most American teams, had begun to appear amongst the Pinewoods Men. Roger Cartwright, the Johnny Appleseed of American Morris, was particularly eager to visit The Source, and managed to convince enough dancers to form a pickup side for the trip. The "Pinewoods New Englanders" (as Roger was constrained to call them owing to the presence of some non-PMM dancers) went to England right after the Peterboro tour, where our English connection, Michael Blanford, had arranged the hospitality. (Michael had visited Pinewoods several years before and become a member of PMM.) According to Fred Breunig's report in the PMM Newsletter, the team were greeted on arrival by the Beaux of London City. They managed to hit the high spots, including Bampton on Whit Monday and the Thaxted Ring Meeting. Karl's successor as Squire was Howard Lasnik, a versatile dancer (Scottish, Balkan, whatever) who had added Morris to his many skills in a remarkably short time. Howard introduced an old Morris tradition to the PMM by formally dancing in as Squire. Not content with that, he and Roberta Edwards decided to have their wedding ceremony at the start of the 1973 Fall Tour, on the green at the Radcliffe Quadrangle. Karl continued to edit the newsletter. In January, 1974, he published Marshall Barron's opinion piece on women dancing Morris in public. This was one of the early rounds in what became a sometimes testy, often shrill, and ultimately bootless argument. The Morris Explosion gathered force in 1974. Both Ring O'Bells, America's first women's Morris team, and Binghamton Morris Men announced themselves in the PMM Newsletter. The Greenwich Men were already dancing in New York, while the Black Jokers and New Cambridge were getting started in Boston. Most of the new sides were being founded by current or former Pinewoods Men, some of whom appeared at the 1974 Fall Tour in their new kits. This might be a good place to list of some of the teams founded by members of PMM; It will give an idea of the role the Pinewoods Morris Men have played In starting this whole thing. Some of these men, like John Dexter and–especially–Roger Cartwright, started new teams whenever they moved somewhere else. That's how it happens. The November, 1974, issue of the PMM Newsletter was Karl's last. Fred Breunig took on the Editorship, and a small but abundantly fruitful seed was planted. Fred's first issue appeared in April, 1975. The first PMM Scholarship, for attendance at a Pinewoods Camp Dance Week, was awarded to Brad Foster in 1975. Since then, it has become, in one form or another, a significant source of aid for serious Morris dancers. Other recipients have included Tim Van Egmond (1976), Bob Childs (1977), Andreas Hayden (1979), Edward Earles (1980) and Cynthia Whear (1980). Meanwhile, the frummage over women dancing the morris continued. To see if we were willing to expand our umbrella to include all Morris dancers, Sue Salmons of Ring O'Bells applied for membership. Then Ring O'Bells as a team asked to participate in the Pinewoods Tour in 1975. Because there were still enough PMM members against the idea, Squire Lasnik felt constrained to turn them down. At the request of the women's side, however, both subjects were put on the agenda for the Ale, which was attended by Sue Salmons and Marilyn Cooper of Ring O'Bells. Because admitting women to membership would require a Bylaw change, we deferred a decision to a special meeting (scheduled for the day of the Fall Tour). But we voted by a large margin to empower the Squire to invite any men's or women's team he wished to any PMM tour. Then reaction set in, and a resolution was passed prohibiting Pinewoods Men, both individually and as a team, from associating in public with any side that failed to segregate the sinful sexes. Finally, Howard Lasnik's term having run out, we elected Chris Walker to be Squire. The 1975 Fall Tour was the first to include organized sides other than PMM. Four teams were invited: two local (Black Jokers and New Cambridge), and two from out of town (Greenwich and Ring O'Bells of New York). After a successful day of dancing, the special meeting was called to order to discuss Bylaw changes. A committee was formed to gather opinions and come up with a proposal to be voted on at the next Ale. Meanwhile, the pot got hotter. Heavy opinions appeared in the Newsletter, some even reasonable. By this time, most of the ire was focused on "mixed" Morris teams; the examples of Ring O'Bells and the new Boston women's side, Muddy River, made it difficult to maintain a credible position against women's teams. Teams of all persuasions continued to proliferate, and in May, 1976, The Pinewoods Morris Men joined eleven other clubs at the first Marlboro Morris Ale, hosted by Marlboro (VT) Morris and Sword. This was the first event of its kind in America, and followed the English pattern both in its organization (Saturday tours, evening feast, etc.) and in its resounding success. Many of PMM's founding members turned out, including some who had retired from regular dancing. John Hodgkin solidified his reputation as the Eastern seaboard's premier hobby horse. This was the occasion of the notorious remark that created the epithet which has ever since clung to PMM like a barnacle to a boat: "Look at those old buggers go!" ​Following through on the new permissiveness, Squire Walker invited Ring O'Bells to join PMM for the 1976 Camp tour. This breakthrough in human relations notwithstanding, all but a few trifling adjustments to the Bylaws were defeated at an unusually contentious Ale. And so the stage was set for the Great Brouhaha of 1977. There is probably no connection, but the 1976 Fall Tour was the first to be rained out. In October, Douglas Kennedy came to the US for a lecture tour. One of his talks in Cambridge was illustrated with dances performed by members of PMM. As Editor of the PMM Newsletter, Fred Breunig had made considerable improvements in its appearance and in the quality of its contents. He published more articles of general interest, as well as more news of other teams, which by now were springing up all over the continent. In January, 1977, he announced that he was starting a new forum, the American Morris Newsletter, which would encompass all Morris activities in the US and Canada. The PMM Newsletter continued, however. Chris Walker became the editor, and returned it to its original focus on PMM affairs, which were about to become very interesting. In June, Norman Singer, a founding member of PMM and then President of CDSS, persuaded that Society's Executive Committee to rescind its annual invitation to PMM to organize the Morris Tour at Pinewoods Camp, on the grounds that we were, as demonstrated by our vote the previous year not to admit women, a discriminatory institution. Unfortunately, no one bothered to tell the team until after the fact. Squire Walker was understandably annoyed, and there were letters back and forth, the outcome of which was that the NEC rescinded its rescission so that the tour could go on as planned. But the pot continued to boil. The contents of the pot were dumped on Shag Graetz, who was elected Squire in August, 1977. In the Fall, CDSS reaffirmed its original decision to bar PMM from organizing the Camp tours, again without asking us to participate in the discussion. Letters were again passed, mostly between the Squire and Sue Salmons, then Chairperson of the NEC. We weren't asking much; only to present our side of the argument to the Committee, but as Sue pointed out, the Committee wasn't really interested. By the end of the year, things were still confused. Meanwhile, PMM continued their usual activities. The Pinewoods Tour, with Ring O'Bells, became a fund-raiser for the newly-formed Pinewoods Camp, Inc. The Fall Tour was held on October 1; though cloudy and muggy, it didn't rain until the last minute (literally). And we did our regular turn in the Christmas Revels. A big change in practice (again, literally) came in 1978. The previous August, after the Camp Tour, several members had asked the new Squire to organize regular practice sessions for the team. We'd been getting a lot of criticism for being a "pick­up" team that only practiced for special occasions. It's not clear just what was wrong with that, as long as we gave a creditable account of ourselves; a lot of traditional teams operate the same way. Still, it was a good idea, and once the Revels were over, a schedule of biweekly practices was instituted, and has continued ever since. The Great Brouhaha began to wind down in February, when Norman Singer resigned as President of CDSS, largely because of this issue; there was a growing divisiveness in the Society, of which he felt that he had become, rightly or wrongly, the focus. Norman's resignation took the steam out of the argument, since no one else seemed interested in pursuing it with the same fervor. Things pretty much went back to the status quo ante; attitudes that were already changing gradually continued to do so, while those that didn't weren't ever likely to, anyway. In hindsight, the whole thing looks silly and overblown; twelve years on, it's hard to see what it was about women dancing Morris (with or without men) that so upset people. I guess you had to be there. At the 1978 Marlboro Ale, PMM ran into a different kind of problem, one that continued to plague the team for several years. Many of our regular dancers were also members of other local teams, and most of them chose to attend the Ale with those sides. As a result, we never really put together a full side, and our dancing suffered. Chris Walker resigned as Editor of the Newsletter after the July, 1978, issue; the Squire, sensing an opportunity to blather on without restraint, took over. In November, we lost a valued friend and founding member when Karl Rodgers died on Thanksgiving Day, after a long battle with cancer. In his year as Squire, he started the Newsletter, and introduced the idea of a Pinewoods Scholarship. The Newsletter flourished, and spun off the American Morris Newsletter; at the time Karl died, Fred Breunig was well on the way to establishing AMN as the premier forum for Morris matters in this country. The scholarship had been established in 1975; it was only fitting that it be renamed in Karl's memory. By 1979, opportunities to dance out were coming more often, as more teams came into existence and got cranked up to performance pitch. Besides the Camp and Fall tours and the Marlboro Ale (where, with a full year of regular practicing under our bells, we gave a good account of ourselves), we danced at the New England Folk Festival in Natick, Massachusetts, in the now-standard format of continuous Morris on the lawn in front of the High School. At the 1979 Ale, Rick Conant was elected Squire. By acclamation, Douglas Kennedy, the former Director of EFDSS, was made an Honorary Member, in recognition of his important contributions to the development of Morris in America. Our Fall Tour had become an all-day affair by now, with dancing not only at Harvard, but also on the banks of the Charles River and in downtown Boston. 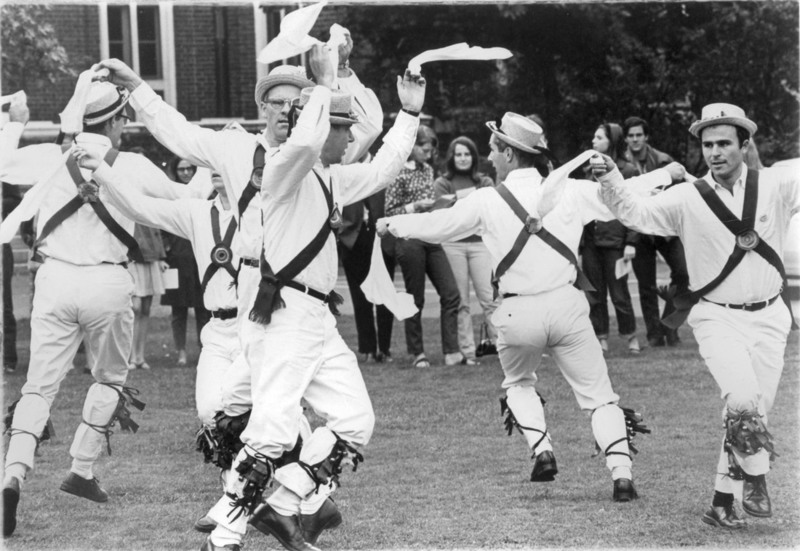 The 1979 Tour was graced by the presence of Morris Sunderland, past Squire of the Morris Ring and redoubtable Fool of the Offley Morris Men of Hertfordshire. After the Tour, Rick and Gerda Conant went to England, where Rick presented Douglas Kennedy with a PMM baldric. The 1980 Tour of Pinewoods Camp was the last organized by PMM. With new CDSS management and the drastically changed Morris environment, the Society felt that it was no longer necessary for PMM to organize what had become something of an anachronism. This seemed reasonable to the team as well; since then, we have organized our own post-Ale tour in the surrounding towns, usually Plymouth, while continuing to dance in Camp at the invitation of CDSS. At the 1980 Ale, we voted, in effect, to merge our Karl Rodgers scholarship with a similar one, also named for Karl, that was administered by the Country Dance and Song Society, both to eliminate some confusion and because CDSS had better resources for finding applicants. Since then, we have contributed the equivalent of a half or full scholarship to the CDSS fund. So where do we stand? That's a good question. The January, 1981, PMM Newsletter was, except for a single issue in 1984, the last. PMM was gradually settling into a new environment, surrounded by Morris and Sword teams of all description and ability. Out-of-town members dropped away, as their own local teams sprang up; we were finally just another Boston Morris club. No longer the only–or even the biggest–frog in the pond, we could stop worrying about social philosophy and just get on with the dance. Tom Kruskal, the kid who organized the first Fall Tour, was elected Squire in August, 1981. Chris Walker (now foreman of the side) introduced PMM to the Oddington Morris in the 1981-82 season; it has become one of the team's principal traditions. Arnold Woodley's Bampton team came to the US in 1982. In Boston, they danced for a huge crowd at Quincy Market on August 5, with PMM and all the Boston teams in attendance. The first Nantucket Weekend and Tour took place in 1983, at Tom and Deborah Kruskal's house. For the next several years, the Nantucket weekend was a high point of the PMM season, where members and their families could get together for a kind of reunion, and the team could dance at various places on that picturesque island for two days without all the organizational hassles of a flat-out tour. For a while in the first part of the decade there was some concern that the Pinewoods Men might be wearing out, but we were rescued by a new generation of dancers who discovered Morris in the 70s. A few of them found their way to PMM and helped revitalize the team. Interestingly, very few older dancers dropped out. Ed Mason was elected Squire in 1983. Another let's-go-to-England movement had a happier outcome than previous attempts in 1979 and 1980. A Twentieth-Anniversary team of eleven Pinewoods men arrived in London on May 19, 1984. Ed Mason's excellent account of this tour was published in the American Morris Newsletter, Vol 8, No 3. It's obvious they had a rousing good time, especially dancing the "Coronation Jig" with its inventors, the Swindon Morris Men. As this involves some rigorous pintdraining, Ed won. 1985 was what they call a watershed year. Joe Kynoch became the first "second-generation" dancer to be elected Squire. Even more momentous was the retirement of George Fogg as Bagman after 21 years. He was succeeded by John Krzywicki; the changing of the guard was complete. Michael Havey was elected Squire in 1987. The team provided an abrupt change of pace at the Christmas Revels when we performed a new dance Chris Walker had learned from Jim Morrison at Pinewoods that summer. Devised by the Shropshire Bedlams, a Border Morris team, it's a non-dance sort of dance with spectacular stick-striking sequences. None of us who learned it escaped without at least one fat knuckle. After three years as Bagman, John Krzywicki decided in 1988 to let someone else have the honor, which we conferred on Steve Roderick. In anticipation of our Silver Anniversary in 1989, Michael Chase set about arranging for another trip to England, but again it fell through, owing, this time, to a sudden influx of newborn children amongst the members of the team. We may be a bunch of Old Farts, but we've got what it takes where it counts. ​Without my file of the PMM Newsletter, I could never have written even this sketchy account. Which means that I owe one to the memory of Karl Rogers, to Fred Breunig (whose American Morris Newsletter was also an essential resource), and to Chris Walker. I called on the memories of Arthur Cornelius, Mike Stimson, Gene Murrow, and Jim Nicholson, as well as many of the present side. They get the credit for the help; I take the responsibility for the mistakes. This being our anniversary, It's our horn we've been tooting. But while the incredible extent and variety of Morris in the US and Canada might have happened anyway, with or without PMM, it is certain that without the Country Dance and Song Society, the Pinewoods Morris Men would never have come in being. Whatever lumps have cropped up in our relationship over the years, our debt to CDSS cannot be overstated. And finally, without qualification or elaboration, to Mr. S.A. (Nibs) Matthews, an Individual and collective "Thank You."